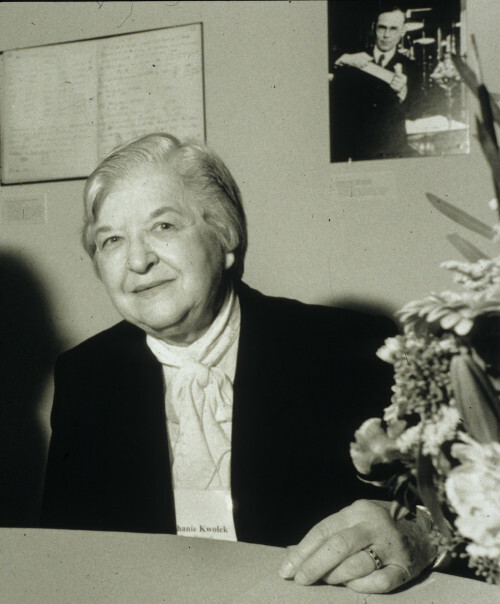 Stephanie Louise Kwolek (July 31, 1923 – June 18, 2014) was an American chemist of Polish heritage, whose career at the DuPont company spanned over 40 years. She is best known for inventing the first of a family of synthetic fibres of exceptional strength and stiffness: poly-paraphenylene terephthalamide—better known as Kevlar. For her discovery, Kwolek was awarded the DuPont company's Lavoisier Medal for outstanding technical achievement. As of February 2015, she was the only female employee to have received that honor. In 1995 she became the fourth woman to be added to the National Inventors Hall of Fame. Kwolek won numerous awards for her work in polymer chemistry, including the National Medal of Technology, the IRI Achievement Award and the Perkin Medal. This article uses material from the Wikipedia article " Stephanie Kwolek", which is released under the Creative Commons Attribution-Share-Alike License 3.0..